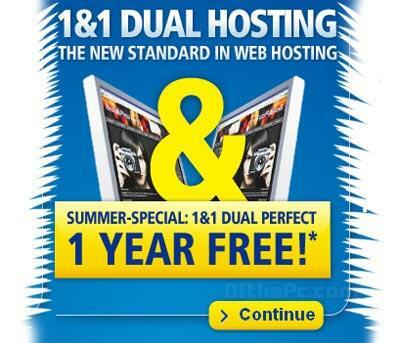 As a Seasonal offer 1&1 Internet Ltd, a web hosting company yesterday announced free hosting package for 1 year on its Dual Perfect hosting package, as well as a special GBP 4.99 .COM domain offer available to new users. Apart from that it provides 3 free months on its e-mail services (limited time, offers available through July only) with affordable and effective solutions to private and professional users.
. As information stored in two highly secure company data center locations. For Linux (GBP 5.99 per month+VAT for Windows) & a, GBP 4.99 one-time set-up fee. Top Level Domains (TLDs), .COM will be specially priced for GBP 4.99+VAT for the first year of registration through the company. The .COM domain brings with it mass appeal for businesses and individuals alike, reinforcing the importance of a globally recognizable domain. The company mentioned amidst the highlighting the demand for Top Level Domains. Company detailed that users of the Dual Perfect package can enjoy the full range of its valuable inclusive features with 12 months of free hosting, on a 24-month contract term in addition to the 12 month hosting, and domain offer, it is also offering 3 months free with both its Instant Mail or MailXchange packages on a 12-month contract term. A one-time set-up fee applies of GBP 0.99+VAT and GBP 4.99+VAT, respectively. Its multiple summertime offers provide customers with the latest powerful online solutions with great cost savings.